Investors are closely watching to see if Tesla is able to meet long-delayed targets and quickly ramp up the Model 3, on which future profitability rests. 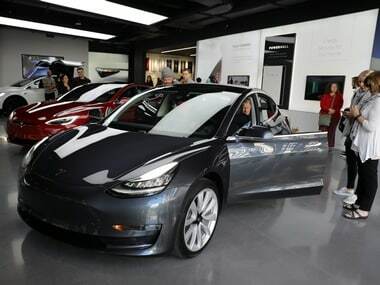 Tesla Inc is aiming to ramp up production to 6,000 Model 3 cars per week by the end of June to reach its weekly goal of 5,000 and allow for a margin of error, automotive news website Electrek reported on Tuesday, citing a letter to employees from Chief Executive Elon Musk. Tesla did not immediately respond to a Reuters request for comment. The news comes a day after Tesla temporarily suspended its Model 3 assembly line in what the company said was a planned pause, its second since February, to improve automation and address bottlenecks that have delayed production. Musk rallied employees in the letter, while warning departments or suppliers who missed the mark, saying they would need a “very good explanation” and a plan for fixing the problem presented directly to him. Shares of Tesla, which ended 1.2 percent lower on Tuesday, rose 1.4 percent in after-hours trading.